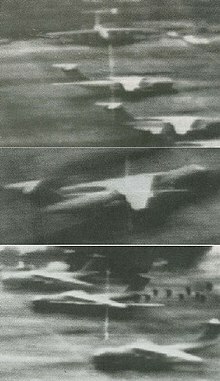 The 1986 United States bombing of Libya, code-named Operation El Dorado Canyon, comprised air strikes by the United States against Libya on Tuesday, the 15 April 1986. The attack was carried out by the U.S. Air Force, U.S. Navy and U.S. Marine Corps via air strikes, in retaliation for the 1986 West Berlin discotheque bombing. There were 40 reported Libyan casualties, and one U.S. plane was shot down. One of the claimed Libyan deaths was of a baby girl, reported to be Muammar Gaddafi's daughter, Hana Gaddafi. However, there were doubts as to whether she was really killed, or whether she really even existed. Military intelligence reports cited Gaddafi fleeing his location and leaving his family members behind when inbound missiles were determined to be targeting his location. This page is based on the Wikipedia article 1986 United States bombing of Libya; it is used under the Creative Commons Attribution-ShareAlike 3.0 Unported License (CC-BY-SA). You may redistribute it, verbatim or modified, providing that you comply with the terms of the CC-BY-SA.